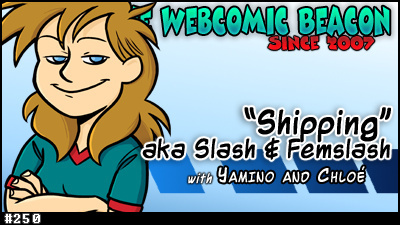 Yamino (Sister Claire) and Chloe (Go Get a Roomie) rejoin the Webcomic Beacon to talk about… OH MY! I just realized what the episode title might suggest! No, Yamino and Chloe are here to talk to us about the fan tendency to pair characters, from established series and stories, into relationships… “Shipping” as it were. Fanfic, slash, femslash may also be used, but “shipping seems to be the most universally used term. Anyways, we had a really great episode! Clocks in at about 1 hour and 45 minutes, so it’s longer than usual, too! Join the show with Fes Works, Mark Savary, and Kelly Turnbull! It’s the 5th Anniversary of The Webcomic Beacon podcast, and prizes are waiting to be won! Two such prizes are up for grabs by DECEMBER 1st, so act quickly! More information and details on prizes and how to win. I love it when you have Yamino and Chloe on, Good show guys!